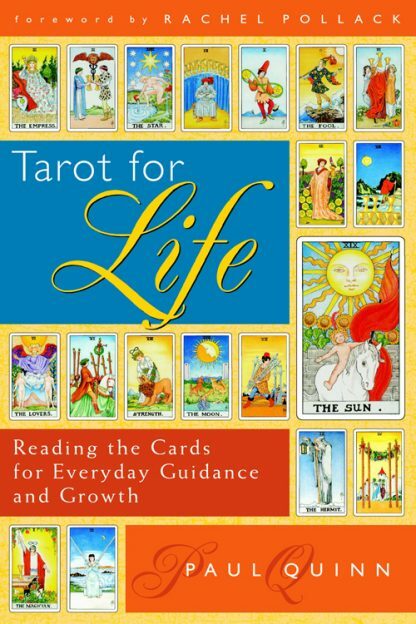 'Paul Quinn transforms the Tarot from fortune-telling into the ultimate self-help tool for intuitive guidance, empowerment, and well-being. Discover how to apply the Tarot, as a lifelong resource, to access inner wisdom and gain deeper insights and practical, inspired guidance in relationships, career, family, and personal growth. With illustrations from the Universal Waite deck, the book offers 78 engaging casebook examples (one for each card) from Quinn�s readings for clients. Drawing on Jungian psychology, the Hindu chakras, and other esoteric traditions, he explains how the Tarot can reveal unconscious patterns and offer soul-directed advice leading to positive changes and greater well-being. Quinn also provides guidelines on reading the cards for oneself and others, interpreting reversed cards, handling difficult disclosures, and psychic self-care. Paul Quinn is an author, teacher, and intuitive coach who uses the Tarot as a tool to help others reconnect to their inner wisdom, potential, and well being. Quinn picked up his first Tarot deck in 1998. The attraction was not only the cards, he says, but how the philosophy underlying the Tarot converged with spirituality, mysticism, metaphysics, psychology, and human potential. A 1999 workshop with Tarot thought-leaders and authors Mary Greer and Rachel Pollack gave him the confidence to pursue Tarot professionally. By 2004 he was listed by Chicago Magazine as a "top talent" for his Tarot skills. He provides Tarot readings for an international client base from his hometown of Chicago. Quinn has been teaching the Tarot in the Chicago area since 2000. His courses attract a wide spectrum of students, from soccer moms to psychologists, and incorporate storytelling, meditation, movement, journaling, games, and other activities designed to bring the Tarot to life. "Paul doesn't just teach the Tarot," says internationally renowned psychic and author Sonia Choquette, "he teaches you to channel the Tarot." An engaging and inspiring speaker, Quinn presents interactive presentations on the Tarot, intuition, and spiritual living, including programs for the Swedenborg Library, Chicago Spiritual Advisory Council, Institute for Noetic Sciences, Transitions Bookplace, and Unity churches. He has been interviewed about the Tarot on Chicago-area radio and television programs, on Australian and Canadian radio, and has written Tarot-related articles for print and online publications. An article he wrote in 2006 about Tarot in the movies was picked up by numerous media outlets. Prior to his Tarot work, Quinn was an actor featured in television commercials including Ramada Inn, Time-Life Books, Montgomery Ward, Lowe's, and ShopKo.